The tear film is in direct contact with the conjunctiva and cornea. It is the second line of ocular surface defence, after the lids. This thin layer (approximately 7 mm) protects, nourishes and maintains the refractive power of the cornea. The precorneal tear film is not secreted as a complete solution. Instead, its numerous components are secreted from various diverse glands and structures distributed around the eye. The tear film is typically made of three layers (lipid, aqueous and mucus) and it has now been demonstrated that there is no clear-cut barrier between these layers. 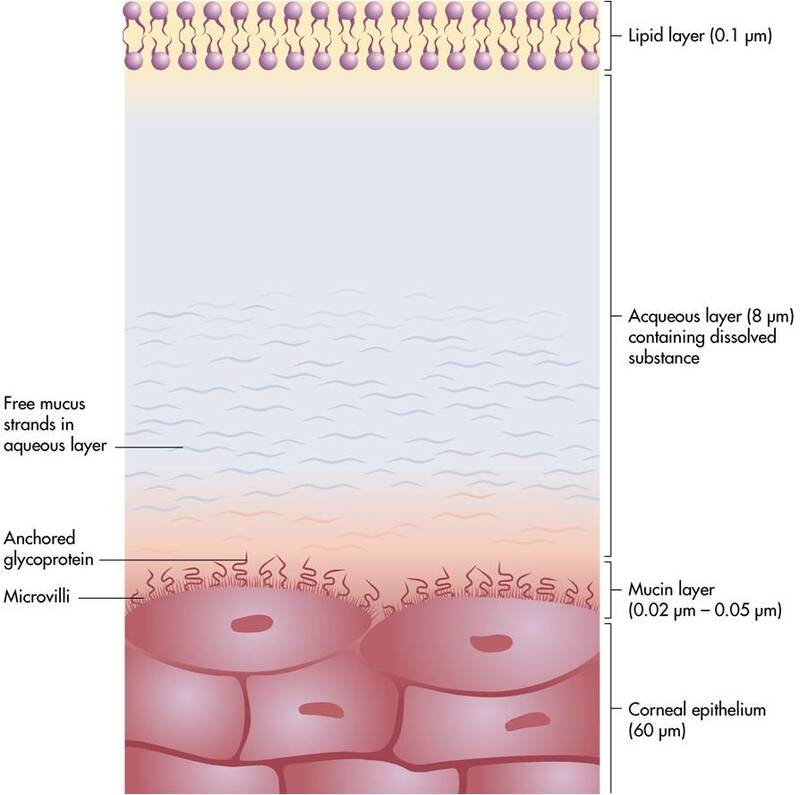 The inner mucus layer is diluted in the aqueous component and adheres tightly to the epithelial cells of the cornea, while the outer lipid layer limits tear evaporation. However, for the sake of simplicity the three layers will be described separately. The three-layered tear film consists of the inner mucus (or mucin) layer, which is in direct contact with the epithelial cells of the cornea and conjunctiva, the middle aqueous (or watery) layer and the outer lipid (or oily) layer.